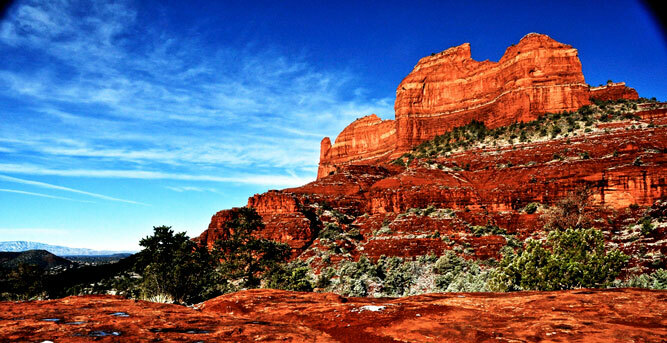 Summary: Airport Loop Trail is a great moderate trail that showcases the beauty of Sedona. Whereas most trails in the Red Rocks lead you into nature, this trail really reveals the iconic structures within Sedona. As you begin the trail you are shown the “Technicolor corner” of Schnebly Hill, the vastness of Munds Wilderness, the grandness of Twin Buttes, Courthouse Rock, Bell Rock, Oak Creek and Cathedral Rock. As you come around the western edge, Mingus Mountain comes into view, Doe Mesa, Chimney Rock and the enormity of Capitol Butte/Greyback (the original names of Thunder Mountain) and Wilson Mountain. The final 1/3 of the trail tends to be a little less appealing as it dips down with views of closeby residential neighborhoods. Summary: Boynton Canyon Trail is a stunning hike through a picturesque canyon that moves you through a varied landscape. Make no mistake the real gem of this trail is found in the final 1/3 of the hike as you enter a high forest with large pines, oaks and even alligator junipers. The first 2/3 of the trail are really just a “means to the end” as you make your way through low growth scrub forest and along the east side of Enchantment Resort. As you hike this trail you will notice a stark contrast in temperatures as you leave the low growth, open red rocks in the first 2/3 and enter “the forest” and rise in elevation. The trail ends in grand fashion as it rises up and crescendos onto a quasi-plateau above tree tops. 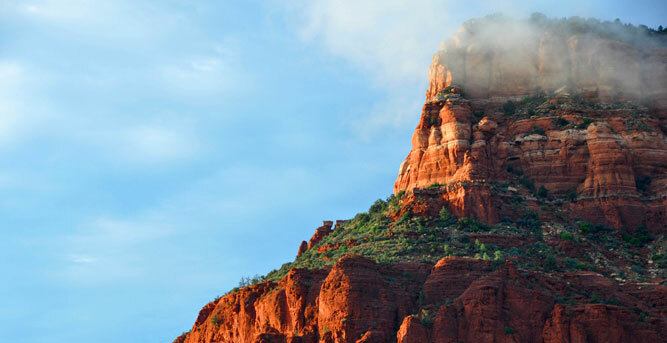 Summary: Beneath the highest structure in Sedona, lies an exquisite trail that takes you up 500 feet to a mesa overlooking Wilson Mountain, Mormon Canyon and Soliders Pass. This is a great trail when town is in full season. The parking and trailhead are located in a secluded area behind uptown. Summary: Boynton Vista piggybacks Boynton Canyon trail for the first 2/3 of the trail then takes you up a moderate ascent to the Boynton Spires. Boynton Vista is the gatekeeper for Boynton Canyon and has long been recognized as a major vortex site in the Sedona Red Rocks. Once atop the overlook, you are met with sweeping views Secret Mountain Wilderness, Deadmans Pass, Doe Mesa and Chimney Rock. The trailhead can become crowded seasonally and on weekends. For a longer hike ending with Boynton Vista, try starting off of Long Canyon Road and hiking 2.5 miles+ to Boynton Vista. Summary: Here is how I know this is a great trail: A young man in love one day comes into the store and asks where is a great place to propose to his girlfriend. I told him of this trail down by Oak Creek that is truly beautiful. He took his girlfriend to this place and she said “YES!” So that means this is a great trail. Cathedral/Templeton Trail is a romantic adventure. 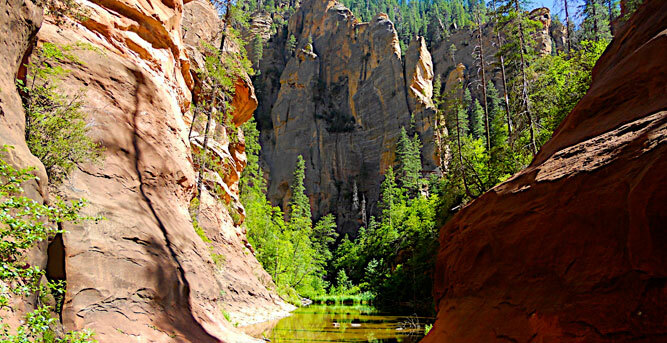 The majesty of Cathedral coupled with the beauty of Oak Creek and the cool canopied forest leading down to the creek make this a great hike for couples in love and families looking for a moderate adventure where the kids can jump around in the water. The is my wife’s favorite hike in the area and I completely understand why. Summary: For the purpose of this book we are presenting Chuck Wagon Trail as more of a connector trail rather than a spectacular, individual hiking trail. Chuck Wagon takes you through a low growth forest crossing through several arroyos along the way. The trail does have a tendency to “wander” a little bit due to it’s “mountain biking” roots—hikers tend to go on a straight route, while bikers attempt to lengthen a route to increase distance. Chuck Wagon is a great catalyst for linking greater/longer adventures together. Mainly provides excellent access to Devil’s Bridge and backside of Brins Mesa. Summary: Devil’s Bridge stands as one of the great geologic formations in the Sedona Red Rock County. 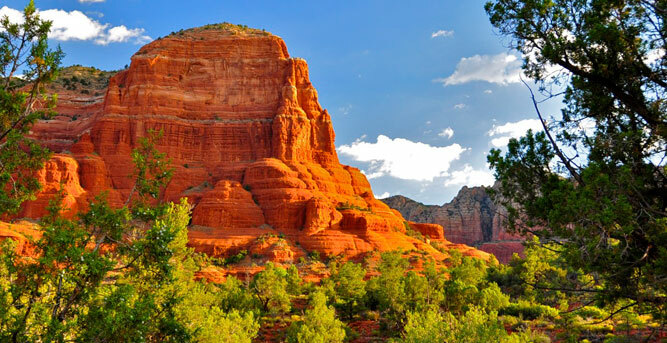 This hike rates in one of the top 5 “must do” trails in Sedona. To make the most of this adventure we like to hike the 1.2 miles via Chuck Wagon Trail to the Devil’s Bridge Trailhead. In the past, many would attempt the drive up FR 152 (Vultee Arch Road). This road is notoriously punishing on cars and is not recommended. Instead, enjoy the winding 1.2 mile hike on Chuck Wagon through an open low growth forest and consider it a “palette cleanser” for the main entrée…the spectacular Devil’s Bridge. Summary: Doe Mountain Trail is one of the most popular trails in the Sedona Red Rock Wilderness—for good reason. Starting in the majestic Secret Mountain Wilderness, the trail quickly traverses up the side of Doe Mountain onto a relatively flat mesa. 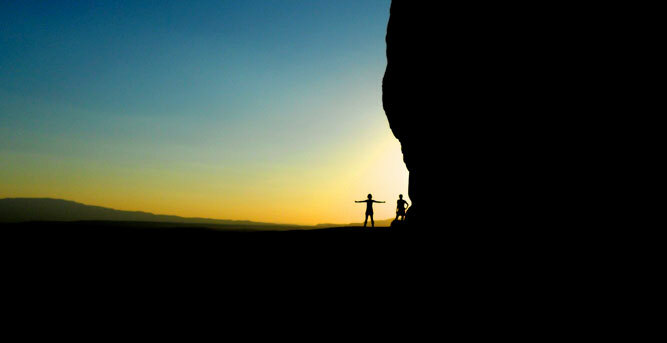 Once on top of the mesa, follow the rock cairns to the other side where you will be met with spectacular 360-degree red rock views. Note: As you approach the end of the trail please use caution. The trail ends on a ledge that drops off several hundred feet. Summary: Think of this hike as a high desert jungle with a built in bird sanctuary. You will have to put in a 1.5 miles of open trail work to get to the best parts of this trail but it is well worth it. This trail does provide refuge from the heat once you move past the 2-mile mark. After the 2-mile mark you are rewarded with a wide array of high canopied trees (cypress, ponderosa, juniper, alligator juniper) and shaded trail with glimpses of red rocks as you go up down and through several arroyos. Note: because of ample shade/moisture, it is recommended you bring a little bug spray, especially in April and May. Summary: Originally a bike trail, this trails starts out a little slow as it meanders across a low growth forest. Be patient…it gets much better. At 1.0 mile the trail rises up and around a ridge that takes you into a spectacular Red Rock “bowl” beneath Mescal Mountain. This alcove provides big panoramic views of Secret Mountain Wilderness and clear across Sedona to Courthouse Butte in the distance. The trail exits “the bowl” and leads you through a spectacular Red Rock corridor eventually connecting to Dead Man’s Pass Trail. Additional options include: a) connecting to Long Canyon via Deadman’s Pass b) connecting to Boynton Canyon via Deadman’s Pass. Summary: One of the oldest hiking trails in the Sedona Red Rock Country used by early settlers (late 1800’s and 1900’s) to transport produce and livestock to market in Flagstaff. The trail drops down into Bear Wallow Canyon and traverses the creek several times. You will find that the creek is often dry throughout the summer months but springs to life with numerous waterfalls during summer monsoons and late spring snow melts off the Mogollon Rim. As you make your way up 2/3 of the canyon you will come upon Cow Pies Trail. Cow Pies is considered a major vortex site in the area and gives you the impression that you have just landed on Mars. Continue along the ridge into the Mitten Ridge Saddle for spectacular views of Oak Creek Canyon and Midgley Bridge. Summary: Soldiers Pass Trail is a moderate trail that offers a back country feel yet is almost located in the middle of town. Sandwiched between Brins Ridge and Capitol Butte (a.k.a. Thunder Mountain), this trail offers everything you would expect from a great trail. The trail rolls through a number of arroyos, past the area’s largest sinkhole (Devils Kitchen), along the “Seven Sacred Pools,” then up 509 feet atop Brins Mesa. The highlight of the trail (according to my children) is the impressive sinkhole which was reported as a major collapse event in the 1880’s (retold by Albert E. Thompson in 1968) and then a secondary event in 1989 increased the size of the sinkhole by 1/3 (large block on the northern wall). 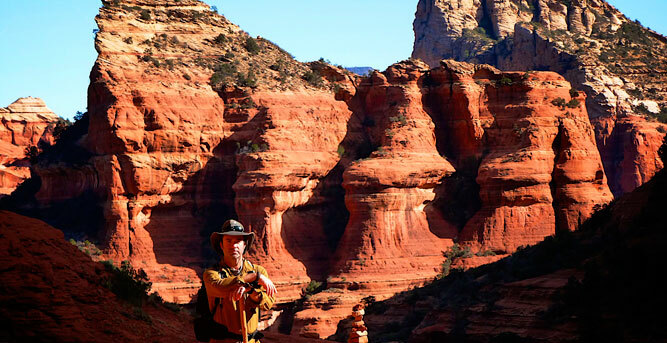 Summary: This is it…the most iconic trail in the Sedona Red Rock Country. This trail captures unimaginable beauty, towering cliffs, perennial water that you cross 13 times and Old West history. Ruins of Mayhew Cabin mark the initial part of the trail, which was built by “Bear” Howard in the 1870’s. “Bear” earned his name by supposedly killing 4 bears with only a knife. In 1880, the Thomas family moved into the area and made Bear’s cabin into a lodge called Mayhew Lodge. Decades later (1924) the famous great American western novelist, Zane Grey, stayed at Mayhew Lodge and wrote the book Call of the Canyon which was later made into a movie. The lodge operated until 1968 and hosted many of Hollywood’s elite including James Stewart, Clark Gable and Walt Disney. The Forest Service took over the Lodge in 1968 and later (1976) burned to the ground. West Fork Trail will always hold a special place in my heart.